String quartet prices for weddings are quite variable. There are some really cheap quartets online. Some display their costs as being £350. This is really cheap for a professional quartet. It takes several years to learn how to play a stringed instrument. To play it professionally to a high standard takes a huge amount of study and dedication. So the quartet that charges around £350 either are using cost to grab customers (like a wedding music Lidl). Or they’re not actually professional musicians. But even if they’re great players, they may not be great at providing a service. We’ve had calls from Brides and Grooms saying that they booked a quartet or wedding string trio. But the musicians have cancelled. They’ve said something like ‘an emergency came up.’ So they’re left in the lurch. This is sadly something that the cheaper groups are more likely to do. They accept a lower cost in order to get the date booked. But then another better offer of work comes in and they decide to take that instead. Although this doesn’t happen all the time, we’ve had around 50 or so calls and emails over the last few years when the couple had been let down. It’s the reason that we started ‘guaranteed availability’. Sometimes people ask for music students. We think that this is a slightly strange request. Would you accept an amateur photographer, or wedding cake maker, or dress maker? Or a venue that was in the process of becoming a ‘professional’ wedding venue. Of course music students can be brilliant musicians. But they won’t necessarily be reliable, or take the booking as seriously as a professional. Or they may be fine – but do you want to take that chance on one of the biggest days of your life? We don’t put our wedding string quartet prices on the website as it can be misleading. A wedding in January in central London will cost you less than one in June in Gloucestershire, for example. Time of year, location and music requested are all factors. Even the time of day makes a difference to what you might expect to pay. For example, if you’re having a morning registry office wedding and looking for a string quartet to brighten it up, then the cost may be lower. That’s because on a Friday and Saturday afternoon there are often lots of simultaneous events occurring. So most professional musicians will have more than one chance of working. But the morning is much more likely to be free, so they can take 2 engagements in one day if the locations are close enough. This is something very appealing to most free-lance professionals. Therefore, how much you pay will partly depend on when you are getting married. Wedding string quartet prices industry-wide are hard to ascertain. But many quartets start to quote at around £500 and go up to around £850 – £950 depending on the timings and nature of the request. There is a myth that cost is added for weddings. The so-called ‘wedding mark-up’. We don’t know any fellow wedding professionals who charge more for a wedding for the sake of it. They are more pressured jobs than corporate events usually. But they’re also on a personal level more rewarding. The costing will be about the same for both even though the corporate job may be a ‘turn up and play’ one with no requests and the music always secondary. Finally, the old adage is usually true. You get what you pay for in general. 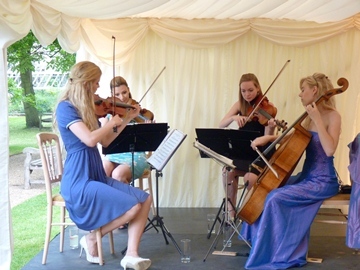 We’ve quoted bargain wedding string quartet prices when a date was free and a good one for us. At other peak times, we’ve had to charge more as we’ve had 3/4 possible bookings on the same date. We’ve seen really cheap music acts for weddings and they’re usually not as entertaining or commented upon. In many ways if you’re going to make the effort to entertain your guests and provide a fabulous soundtrack for the day, why not get the best you possibly can so you have no regrets? The price of a string quartet represents a very small part of the wedding budget, but can have a very big impact. If you want to talk to us to discuss hiring our wedding string quartet, get in touch today. And watch one of our string quartets in action here.